Home › › Mouth and Body › Wisdom Teeth – Keep Them or Remove Them? With age comes wisdom and wisdom teeth. Wisdom teeth represent another milestone in development and change that your mouth goes through in life. Third molars, or wisdom teeth, erupt at a more mature age (between 17-21 years). Sometimes these teeth come though correctly, meaning in the right position or alignment. Then they assist in chewing or function. They may be hard to reach and clean but they can serve a purpose in the mouth. 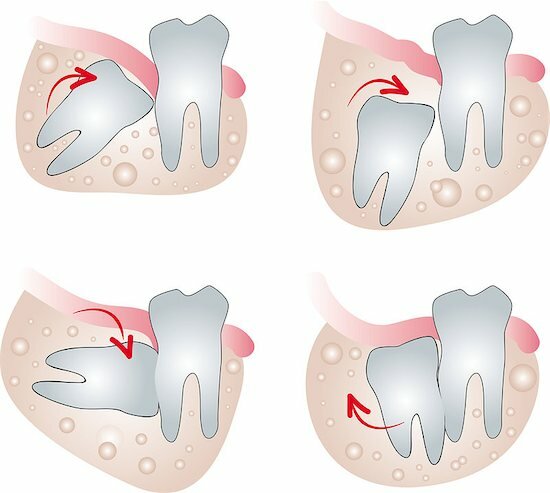 Malpositioning of the wisdom teeth, which can create difficulties in cleaning them and bacterial traps that can impact adjacent teeth (typically the second molar). Decay in the wisdom teeth, typically in the third molars as they are hard to reach and clean. If the decay is advanced and the tooth requires a root canal, then due to complex tooth canal anatomy and the difficulty of the root canal treatment, it may be better to remove the tooth. Horizontally aligned wisdom teeth, which can impact the periodontal health of the area and adjacent tooth, typically the second molar. Horizontal positioning of the third molar, which can cause issues with cleanliness in the area and tooth decay on the root of the adjacent tooth. In such a case, both teeth (the second and third molar) could be lost and removal of the third molar should be considered. Understanding the positioning of the third molar and its relationship to the infra-alveolar nerve. A CT scan (or 3 dimensional image) of the area should be always considered before third molar removal, so the surgeon is aware of the infra-alveolar nerve’s position and can prevent nerve damage that could have life long debilitating results, such as permanent numbness of the area and the lip. It is very important to consider the pros and cons to any procedure. The patient and doctor must both understand the prognosis of the treatment and each decision’s outcome so that the least harm is done overall. At PreserveYourTeeth Dentistry we use 3D scan imaging for any area of concern. We collect the most accurate information and eliminate any guesswork in the process.